Tropical peatlands are critical carbon stores globally, and Indonesia has the largest area of tropical peatland in the world. These peatlands are a major source of carbon emissions due to the drainage of large areas for agriculture, forestry, and fire, and therefore strongly influence global carbon cycles. A reliable monitoring, reporting and verifying system is required to understand the roles of Indonesian peatlands, but proper methodologies and tools to quantify the amount of belowground carbon stores are still lacking. In addition, to date the Indonesian Government has no official peat depth maps available. Dr Rudiyanto, a Crawford Fund trainee from the Bogor Agricultural University, Indonesia, is currently learning how to use digital soil mapping to estimate the depth of tropical peatlands and the amounts of carbon stored in them. 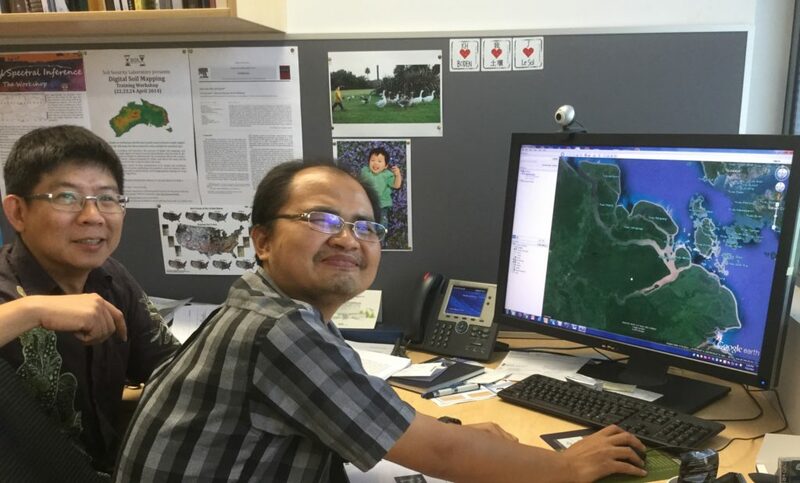 Rudiyanto is working with Professor Budiman Minasmy of the University of Sydney’s Soil Security Centre, to develop a model which will use field data from peatlands in Indonesia to validate and further refine the model. He expects to publish and present his findings at the next International Peat Congress in August 2016 in Sarawak, Malaysia. The Soil Science group at the University of Sydney is recognised as a world leader in digital soil mapping. This research training aims to further develop digital mapping technologies for peat depth mapping in tropical peatlands, particularly in South Sumatra and West Kalimantan. “Dr Rudiyanto’s visit will establish a collaboration in the research of quantifying the amount of belowground carbon stock in Indonesian peatlands. Quantifying the amount of carbon will lead to a better understanding of the global significance of Indonesia’s peatlands, and thus lead to a better conservation program. The information will also enable recommendations and suggestions to policy makers for sustainable peat management in Indonesia”, said Professor Minasmy. Associate Professor Helen Scott-Orr, Coordinator of the Crawford Fund’s NSW Committee, visited Dr Rudiyanto at the University of Sydney during his stay. “This training follows on from a previous NSW Crawford funded visit in 2010 by another Indonesian researcher, Mr Yiyi Sulaeman, to learn about the basics of digital soil mapping as part of his PhD studies. The field has expanded a lot in the last five years and there are many new applications being developed. These allow predictions of soil properties and planning of future uses and, where appropriate, soil management or remediation programs,” said Helen. You can read about the previous training here.